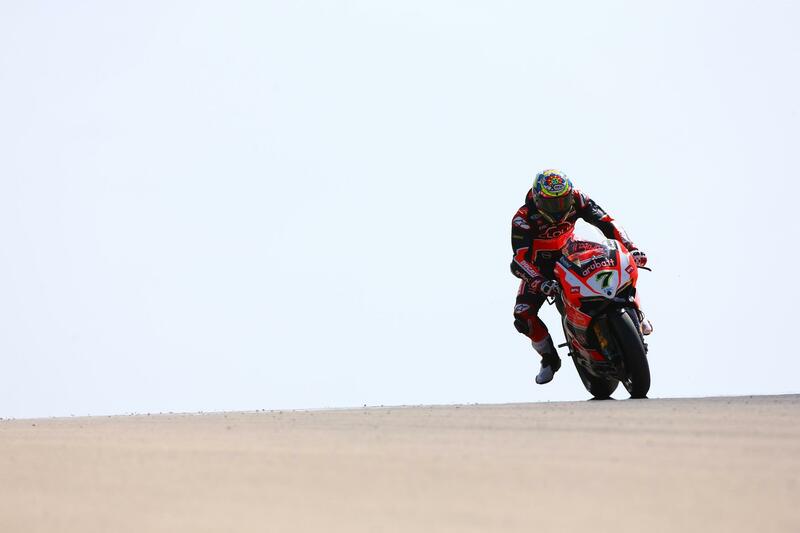 Aruba.it Ducati rider Chaz Davies dominated race two at Aragon to take his first victory of 2015 as British riders once again ruled the podium. Davies got the jump on the rest of the field away from the lights, and was untouchable throughout the race, crossing the line 3.190secs ahead of race one winner Jonathan Rea. Unable to catch Davies, Rea had to settle for second place, although he was hounded by pole sitter Leon Haslam in the second half of the race, but the Aprilia rider just didn't have the pace to pass the Kawasaki. 2013 champion Tom Sykes' weekend ended badly on the sixth lap, as the Kawasaki rider highsided spectacularly exiting the penultimate corner on to the long back straight. Sykes, seemingly winded, was slow to his feet but eventually walked away. Reigning champion Sylvain Guintoli followed Sykes into the gravel a lap later, lowsiding his Pata Honda at turn 14. After a mechanical issue in race one, Alex Lowes will have been looking forward to race two, but a mistake on the opening lap forced the young Brit off track, before he rejoined dead last. Lowes managed to work his way up to 14th position, less than a second behind team-mate Randy de Puniet. MV Agusta rider Leon Camier rounded out the points in 15th place.